Slovenia's housing market has had the fastest annual house price growth in the EU during the year to third quarter of 2018, extending three previous years of real price rises. But the strong rises seem to be stretching people's capacity to buy, and during the latest quarter there has been a decline in prices in Ljubljana, a significant decline in the prices of new apartments, and a big decline in transactions. Slovenia's nationwide house price index rose by 15.1% (13% inflation-adjusted) during the year to Q3 2018, based on figures from the Statistical Office of the Republic of Slovenia. Its nearest rivals were Netherlands (up by 10.2% y-o-y), and Ireland (up by 9.1% y-o-y), according to Eurostat. In comparison, house prices across the EU increased on average by 4.3% y-o-y during the same period. On a quarterly basis, house prices in Slovenia were up 1.9% (2.3% inflation-adjusted) in Q3 2018, according to the Statistical Office of the Republic of Slovenia. In Ljubljana, Slovenia´s capital, the house price index for existing flats rose by 8.9% (6.9% inflation-adjusted) during the year to Q3 2018. On a quarterly basis, house prices fell by 1.8% (-1.5% inflation-adjusted) in Q3 2018. In the rest of Slovenia, the prices of existing flats increased by 10.6% y-o-y (8.6% inflation-adjusted) in Q3 2018. On a quarterly basis, the price index went up by 2% (2.3% inflation-adjusted) in Q3 2018. In contrast to the surging house prices, transactions have declined. In the third quarter of 2018, the number of dwelling transactions plunged by 17.2% to 2,014 units from the same period last year, according to the Statistical Office of the Republic of Slovenia. Most of the decline was observed in newly built dwellings, with transactions plunging by more than half (58.3%) from the previous year. Transactions of existing dwellings also dropped, but at a slower rate of 14.5%. The decline could be attributed to a lack of supply despite strong demand, since according to a study by the Ljubljana Faculty of Social Sciences and the Institute of Spatial and Housing Policies, apartment construction in Ljubljana has been significantly slower than the capital's population growth. During the period 2008 to 2017, the number of apartments increased by only 3,300 units, way below the rise in the number of residents - about 15,500. The study estimated there would be an apartment shortage in Ljubljana of around 16,000 units by 2025. However affordability may be a large part of the reason for the drop in transactions. Average house prices have accelerated between 2011 and 2017 at a faster pace (up by 26%) than wages (up by 5%). Despite interest rates being been low and falling, lending for house purchases rose by only 4.4% to €6.24 billion (US$ 7.16 billion) during the year to December 2018, according to the country's central bank, the Bank of Slovenia - less than the increase in house prices. Supply is trying to catch up. In 2018, the total number of dwelling permits issued for residential buildings increased by 2.8% to 2,788 units, according to the Statistical Office of the Republic of Slovenia. The floor space of dwellings authorized also rose by 10.9% to 775,237 square metres (sq. m.) during the same period. Foreigners have been able to buy property since February 2003, on a reciprocal basis. Reciprocity is a principle verified by the Ministry of Justice (MoJ) on the basis of the Law on Reciprocity (Official Gazette No 9/99). Then following accession to the EU in 2004, EU citizens may now buy properties in Slovenia without restrictions. How much will you earn? Gross rental yields on apartments are moderate to good in Ljubljana, at around 4.5% to 5.1% in the city centre, and higher outside. To define terms, the gross rental yield is the rent the landlord will earn - before taxation, vacancy costs, and other costs - compared to the purchase price of the property. The gross rental yield in the Old Town is about 4.5%-5%. For these areas we used the Global Property Guide's own research. 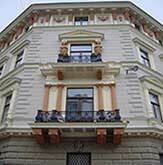 Outside, in the wider city and in Ljubljana surroundings, we used estimates from the real estate portal Nepremicnine. Their figures suggest that gross rental yields on houses can reach 7.8% in the city, and 10.5% in the city's surroundings. This is an excellent return. How much do apartments cost? Apartments in the Old Town of Ljubljana cost on average, EUR 2,900 to EUR 3,200 per square metre (sq.m.). In the nearby areas apartments tend to be cheaper, selling for around EUR 2,300 per sq. m. In the city's surroundings, EUR 1,450 per sq. m. is more usual for an apartment, EUR 1,000 for a house. How easily will you rent your property? Anecdotally, properties can be quite hard to let. Ljubljana is a small place. The number of expatriates, embassies, and international companies is small, which again restricts the supply of tenants. Round trip transaction costs are low in Slovenia. See our Property transaction costs analysis in Slovenia and Round-trip property transaction costs in Slovenia, compared to the rest of Europe. Rental Income: Nonresident foreigners earning rental income are generally taxed at 25%. A standard deduction of 10% of gross income is available for all taxpayers earning rental income to account for maintenance costs. Capital Gains: Capital gains realized from the sale of properties are taxed varying rates, depending on how long the owner held the property prior to the sale. Inheritance: Inheritance of spouses and direct descendants are not taxed in Slovenia. Other heirs are liable to inheritance tax and the applicable progressive rates vary depending on the relationship between the donor and the recipient, and the value of the property. Residents: Residents are taxed on their worldwide income at progressive rates, from 16% to 50%. Roundtrip transaction costs are around 4.434% to 8.26% of the property value. The 2% Transfer Tax is paid by the seller while the real estate agent’s fee at 4% (plus 20% VAT) is typically split between buyer and seller. Rent: Rent and rent increases can be freely negotiated but must be based on the market rate. In theory, rents must not be 50% higher than average rents in the same local municipality. In practice, this is not followed; landlords can draw contracts and change it as they wish. Tenant Security: If the contract is for a definite period of time, the landlord has no obligation to renew the contract. If there has been no renewal 30 days before contract expiration, the tenant has to vacate the apartment at the day of expiration. Slovenia's economy is growing strongly, and in 2017 recorded a ten-year growth high of 5%, according to Statistical Office of the Republic of Slovenia, with robust increases in exports (up by 10.6%), gross capital formation (up by 8.4%), and domestic demand (up by 4%). This robust economic expansion continued during the first three quarters of 2018. In Q3 2018, the country's GDP expanded by around 4.5% y-o-y as domestic demand continued to increase at a solid pace. In the last four years, the economy grew by 5% in 2017, 3.1% in 2016, 2.3% in 2015, and 3% in 2014. The economy was expected to have grown by 4.2% in 2018. Slovenia's economic outlook remains positive, with the central bank predicting 3.9% growth in 2019 and 3.4% growth in 2020. The government achieved a budget surplus of 0.1% in 2017, according to the European Commission, after deficit of 1.9% of GDP in 2016. The budget surplus is expected to be around 0.5% of GDP in 2018, according to Finance Minister Andrej Bertoncelj. Gross public debt is falling, projected to be at 70.3% of GDP in 2018, down from 78.7% of GDP in 2016, and is expected to fall further to 66.6% of GDP in 2019. Moody´s upgraded Slovenia´s credit rating in September 2017 from Baa3 to Baa1. Standard & Poor´s upgraded the country´s credit rating in June 2017 from A to A+. Fitch upgraded the country´s credit rating in September 2016 from BBB+ to A-. Inflation stood at 1.4% in December 2018, down from 1.8% during the same period last year, according to the Statistical Office of the Republic of Slovenia. Unemployment was 5% in Q3 2018, Slovenia's lowest unemployment rate since 2008, according to Statistical Office of the Republic of Slovenia - down from 6.3% a year earlier.